By Texyt Staff - Fri, 06/15/2007 - 11:08. Prices for PDA-style Windows SideShow devices will start from about $80, according to a developer that demonstrated prototypes to Texyt.com today. 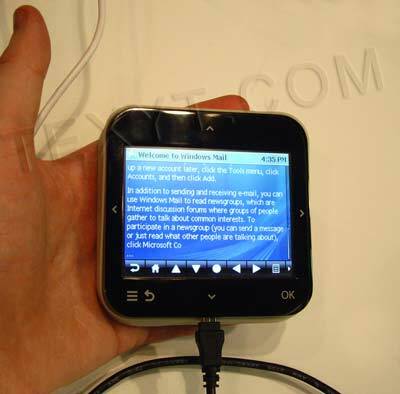 The touchscreen handheld gadgets share many of the features of PDAs, smartphones, and media players like Apple's iPod, but they connect wirelessly to a PC to send or receive data. 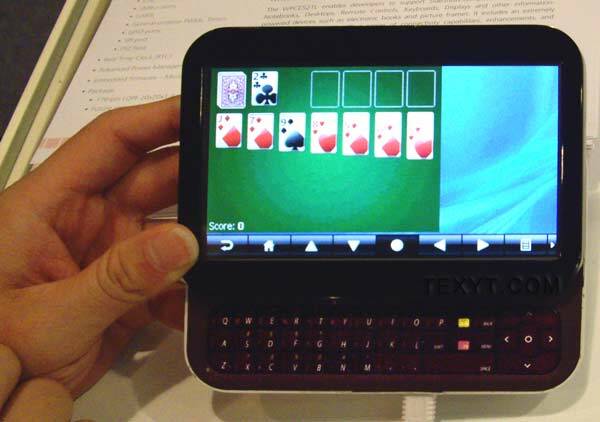 A high-end SideShow device with a slide-out Qwerty keyboard will cost 'approximately $150', said staff of Taiwan-based chip manufacturer, Winbond, which makes CPUs and other chips for the devices. A smaller device with a square 3.5-inch touch screen will cost 'about $80', they predicted. The SideShow handhelds connect to a host Windows Vista PC via Bluetooth to synchronize email, contacts, appointments, RSS feeds, documents and other data, said Winbond senior sales manager, David Sung. They can download and play music, games, and media files. While Winbond did not identify the prototypes, which are marked with Microsoft labels, they appear to be engineering samples developed by US-based Ricavision, which is working closely with Microsoft on the first standalone Windows SideShow devices. Ricavision is developing several SideShow devices. These include the MK 140 FM 'Fridge Magnet/Scribbler Device', which appears to be the smaller of the two prototypes shown by Winbond. The larger prototype with a sliding keyboard appears to be Ricavision's 'MK140 eChatter'. This has a 5-inch rectangular screen. The small keyboard allows users to edit documents, or respond to email hand have the response sent the next time they synchronize with the host PC. The keyboard can also be used for real time instant messaging via Bluetooth - if a host PC is within range. A maximum range of 100 meters is possible, Winbond staff claimed. However, this is likely to be reduced by interference from other wireless devices, they pointed out. The devices have a USB socket to recharge their internal batteries, and for data synchronization if Bluetooth is unavailable. Both products will run for 16 hours on battery power, according to Ricavision. Ricavision is also developing the 'Home E-Reader', a Windows SideShow handheld with a large, high-contrast, low power e-Paper display. The E-Reader is designed for off line reading of downloaded documents and e-books. Microsoft is stressing to its partners that SideShow devices are intended to be a companion to Windows Vista PCs – or at least, that is how they should be presented. 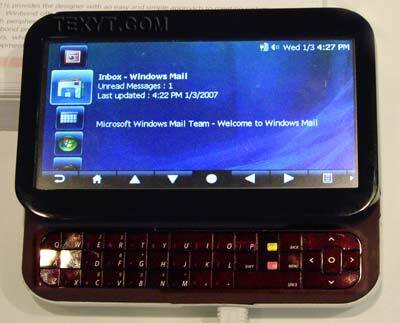 One manager from a hardware developer attending Microsoft's WinHEC conference in Taipei, who did not wish to be named, claimed that Microsoft is hoping to create a new market for low cost SideShow devices without alarming the smartphone and PDA makers who are using its Windows Mobile OS and Pocket PC platform. However, with the potential for overlap in features and end users, this is difficult, he said. Smartphone makers are said to be worried that corporate customers might opt for cheaper, less feature-rich phones if they can rely on a cheap SideShow handheld for contacts, e-mail and scheduling. Microsoft has announced that Windows Mobile will soon support SideShow gadgets, perhaps alleviating this concern. Winbond has developed an integrated controller chip for SideShow, the WPCE521L, which incorporates a 32-bit ARM RISC CPU core, a LCD interface, USB interface, power management, and other functions. The company also offers SDRAM and other chips for SideShow products. Staff estimated the cost of the key chips for a standalone SideShow device at about $10. The most expensive component is the color LCD touchscreen, they said. Winbond is offering a complete reference design, making it easy for manufacturers to rapidly develop their own low cost SideShow devices using its chips. Until recently, the main chip developer for SideShow devices was PortalPlayer, which also designed the chips inside the original iPod, and was recently acquired by Nvidia. The new handheld SideShow devices are expected to be on the market well before the end of the year, Winbond staff said, but could not give a precise date. Ricavision has already begun marketing a final version of a SideShow remote control for Windows Media Center PCs. Correction: An earlier version of this article erroneously stated that PortalPlayer was acquired by Apple. PortalPlayer was in fact purchased by Nvidia. Thanks to Jerry Kindall for the correction. By Jerry Kindall (not verified) - Fri, 06/15/2007 - 16:25. PortalPlayer was acquired by NVIDIA. Their Preface platform for SideShow is now an NVIDIA product. By Texyt - Fri, 06/15/2007 - 18:02. By Anonymous (not verified) - Fri, 06/15/2007 - 17:04. By chris k. (not verified) - Tue, 08/26/2008 - 01:05. By Anonymous (not verified) - Fri, 06/15/2007 - 17:16. I am so sick to death of Micro$oft ramming its fat, bloated software into every last little niche in every market. Stop Bill, just stop. By Anonymous (not verified) - Sat, 06/16/2007 - 05:22. I am so sick to death of people who are MS haters. No one cares. And BTW, Bill doesn't run the company anymore. By Anonymous (not verified) - Sat, 06/16/2007 - 06:37. By Anonymous (not verified) - Sat, 06/16/2007 - 17:16. By Kab (not verified) - Sat, 06/16/2007 - 18:03. Since when is it stealing to want to give your money to artists and not to fat middlemen? By Anonymous (not verified) - Wed, 05/21/2008 - 20:44. So... do you give your money to individual artists and not the fat middle man? Or do you, like most, just take the music and never give a dime to the artists, musicians, etc who make the music? By Flying (not verified) - Sat, 06/16/2007 - 05:12. Those gizmos are capable of 16GB of flash memory, and have 4GB at standard. By Anonymous (not verified) - Sat, 06/16/2007 - 19:36. ...how is not paying for the music at all giving your money to the artist? By kerunt (not verified) - Sat, 06/16/2007 - 21:37. The problem with DRM is that I cannot play my LEGALLY BOUGHT music on half of my devices! Pirated music (and software) will _always_ be available. Those who want pirated software will get it. DRM is just making life harder for the rest of us. Actually, instead of buying my next album, I'm just going to BitTorrent it. You can thank DRM for that. By Kab (not verified) - Sun, 06/17/2007 - 07:36. By Anonymous (not verified) - Sat, 06/16/2007 - 20:52. By Anonymous (not verified) - Sun, 06/17/2007 - 04:15.
hateful comments directed towards a man who no longer runs a company which is putting out a reference design for a product in a newly minted market stemming from interoperability with hardware running the newest release of one of their own products. I might be missing a point here or there, but I believe this is an optimally stupid comment. By GNUguru (not verified) - Sun, 06/17/2007 - 07:54. By Anonymous (not verified) - Sun, 06/17/2007 - 09:31. More anti-Microsoft comments, from yet another faceless, internet user. Go team! You guys are sure to get the market share of alternative OSes up REAL high soon. By Sean T. (not verified) - Sun, 06/17/2007 - 07:19. This is an interesting development, but not much more than a niche market for gadget freaks. If it came with a standards compliant web browser and wi-fi (802.11b would be plenty) it would be a compelling device. Right now this concept device is a crippled e-mail chat device that plays solitaire (apparently) and some music. My PSP does more than this device, but I would enjoy the touch screen and keyboard that the SideShow has. Maybe when version 2.0 or 3.0 hits the SideShow would have enough useful features to be worth buying. Right now, I'll pass. By Anonymous (not verified) - Sun, 06/17/2007 - 14:40. I don't care, this is just a another flash in the pan gadget from MS. It's going to be a closed platform, until some one hacks it and installs Linux or some other kind of home brewed OS like Rock box. Vista is a buggy bloated abortion of a OS, I'd switch to Linux before I'd upgrade to Vista. By Anonymous (not verified) - Mon, 06/18/2007 - 13:56. Are you people brain-dead? Its suposed to be a closed platform. Its not a PDA, per se. Its a sideshow device, and its only purpose in life is to be a sideshow device. Some manufacturers will expand it and give it other functionality, but at its heart, its meant to interact with Vista only. What makes it open is that you can write a sideshow gadget to run on it. All you fu***ng linux users should shut the f**k up. This in no way takes away market share from your OS's. It is a gadget, and its for those who are Vista users. How this conversation ended up being about DRM, i dont know, but undoubtibly shows the intellect and maturity of internet users. I have absolutely no idea how posts like this become microsoft-attack conversations. All of you are morons. TALK ABOUT THE DEVICE IN QUESTION!!! By Paul (not verified) - Mon, 06/18/2007 - 14:48. By Brendan (not verified) - Mon, 06/18/2007 - 15:17. I am going crazy waiting for the ricavision bluetooth enabled sideshow remote. To be able to control my vista media center from the whole house will be awesome. Now I can control what I am listening to while lounging on my patio. And more than control to the next song, I will be able to update the play list, see what is coming next, etc. And for all the people railing against this tech or MS. Just don't buy it. I did not purchase Vista because of SideShow devices, but they will certainly let me enjoy my current setup alot more. 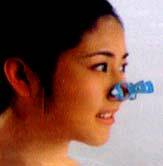 By Anonymous (not verified) - Tue, 06/19/2007 - 14:43.
if this gadget is handy (wait for the reviews of course) and costs around 80 bucks it might be worth considering. I like the 3.5 inch wide display. The zune didnt go anywhere though, so some caution is needed when MS makes a gadget. The anti-MS rants are wildly irrational and misplaced: they really should chill a bit, or at least make fun of the zune. By Anonymous (not verified) - Thu, 06/28/2007 - 14:19. As soon as its cracked to run linux im so going to get one. Can this thing be able to use emulators and roms? By alterdimension - Fri, 07/06/2007 - 20:01. Can this thing make use of emulators and roms? For example can use a snes emulator but then use snes roms? Alot of recent game handhelds like psp and gp2x do that do that which makes those hand held more desirable than others. Can this thing make use of emulators and the roms? People need to know if this can be done. hand Systems that make use of emulators and roms. Hand helds that do this are more attractive to me. By ametalice - Sat, 07/07/2007 - 08:51. Dude I can't wait until they hack this thing.....yo! By Heathren Icefarger III (not verified) - Thu, 09/13/2007 - 05:27. Man when they hack this sucka, I'm gonna install me some Linux up onto this thing. After I rewrite the bios I can then load Linux up in the ROM....you know. Next I think I will take a break, eat some marshmellows, maybe drink a Michelob Ultra. Once rested up I will be going to town, I'm going to transform this little device into my "SideHo".....get it? With it finally hacked I will start to write the binaries that will make up my lastest creation.....THE LINUX DRIVERWRITER PRO!!!! Behold, you will no longer need to install a geeked out, memory leaking driver, that a 13 year old in East BumbleFu(# wrote. These advances, within 4 years time will result in the reversal of dominance in the desktop OS Market. Linux will own 92% of the desktops in the world!!!! MUU HA HA MUU HA HA!!!! Next you hear a voice, "I told you to have this stocked before closing, stop daydreaming and get to work". Alerted by the banter of Radio Shack #236's Store Manager you quickly spring to attention. By terminal 7 (not verified) - Fri, 10/26/2007 - 22:16.
i tell you why - because it makes them feel like theyre showwing off that they know a bit about the industries their dissing, its pathetic ! if you werent interested you wouldnt be reading or commenting so go away ! By Anonymous (not verified) - Wed, 11/14/2007 - 00:28. I think this has gone way off topic here, surely the point is that here we have a device based around an ARM processor, a touch screen and a keyboard. Basically a PDA, but it's cheap, which will open it up to the hacking world. Some people will put linux on it so they can have the functionality they desire, some will leave it more or less as is with some customizations on the user interface. No-one is right or wrong for saying either OS is better, both are a tool for a job. Though we all hate to admit it, windows does work, otherwise it wouldn't have the market share it does. I think a lot of the resentment comes from the feeling that we shouldn't support a monopoly, in the same way we shouldn't buy coca-cola. But we all do it because that is the way society works. I personally use both OSes because they do different things particularly well. The DRM argument is a completely separate thing and shouldn't really be discussed here. By Gavin (not verified) - Mon, 01/21/2008 - 12:52. By Arush Wadhwa (not verified) - Tue, 05/19/2009 - 08:22.
this is the best gadget i have seen in my small life of 11 years till now !